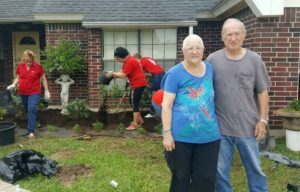 More than 30 volunteers in red shirts and dirt-caked gloves toiled through the morning and into the afternoon May 11, pushing wheelbarrows of soil and toting potted plants across a yard in Crosby. Keller Williams Northeast serves the Kingwood, Humble, Atascocita and Lake Houston areas. Every year, its office participates in the company-wide Renewing, Energizing and Donating (RED) Day volunteering initiative in which Keller Williams offices worldwide find ways to give back to their communities. This year, Keller Williams Northeast sought a cause that would somehow benefit a veteran. It just so happened that Keller Williams associate Ashleigh Morris‘ grandfather is a veteran of the United States Army, and he and his wife were in need of assistance. In addition to being a retired veteran, Wayne Scrivner is a skin cancer survivor. His wife, Jo, also is a cancer survivor, currently going through radiation therapy due to breast cancer. Among Jo Scrivner’s passions are raising parrots and gardening. Without the energy necessary to keep up her garden, trees and flowerbeds, yardwork became an increasingly more daunting task. Thanks to the hard work of the Keller Williams volunteers, the Scrivner’s property received a makeover. The vegetable and herb garden was tilled, weeded and replanted, trees were pruned, flowerbeds were preened and a recently felled tree was chopped into neatly stacked firewood. The Scrivners were amazed at the volunteers’ efforts and overcome with gratitude. This year, the RED Day spirit of giving extended beyond the Keller Williams Northeast associates as other local businesses and neighbors jumped on board with the cause, donating supplies, funds and refreshments. For Bowdoin, the culture of giving back is what drew her to Keller Williams. For more information, visit www.kwnortheasthouston.com. Keller Williams Events, Keller Williams Realty, Keller Williams Realty News, KW RED Day. permalink.